As someone whose life is so totally entrenched in the arts- from photography, drawing, printmaking to yarn art and sewing, I encourage my children on a daily basis to create and think creatively. When they're bored, I try to set them up with arts and crafts. Sometimes I have a lot of time and we make something elaborate, and others it's a fleeting learning experience made from popsicle sticks, toilet paper holders and glue. One of the most important things to remember when teaching your children (or other people's children) about art is that it is one subject that is totally subjective. What is aesthetically pleasing to one person is not to another, what meaning I draw from a painting will probably differ from the meaning you draw from it. This is not to say that either is wrong, with most art it is the reaction, the discussion, the feeling that determines the success of the art. It is ok to make mistakes, it is ok to draw a purple ladybug (c'mon, many artists have had a weird streak! ), and it is ok if it doesn't look like it could sell at a gallery, let alone a shelf at walmart. It is the creation, the exploration and curiosity that make teaching art so much fun. Here are two examples of where I had to let go of perfection (the kind I would expect from myself) and let my kids have fun with it. We were at the craft store one day and I always have to go to the clearance section- sometimes you can get great swatches of fabric for super cheap just because it's small or the last of a roll. 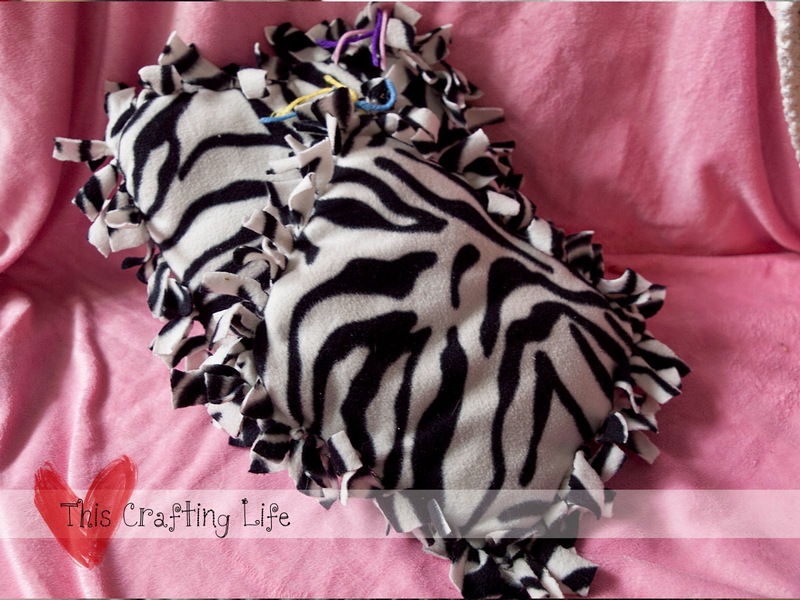 I found this awesome zebra fleece which I estimated from the measurements should be enough to make two small throw pillows. I set this fabric aside for a rainy day and when it came, it was the easiest craft ever and the girls were both totally entertained. Cut two squares of fleece about 4-5 inches bigger than you want your pillow. Cut 1" strips about two inches in all the way around the squares (holding them together). Tie matching strips together around three edges, lightly stuff with poly fil and tie knots around half of the remaining row. Add more stuffing if needed, finish tying knots around. I have a 3 year old and a 7 year old. I pretty much let my 7 year old do her entire pillow by herself. She was able to cut the strips, tie all the ties and stuff the pillow. (I think she did need some help with a few ties but she did 99% of the pillow by herself) For my little one, I cut all the strips and it was a good lesson on how to try to tie knots. She especially enjoyed stuffing the pillow. They both love their pillows and display them on their bed, and it makes them proud to show someone what they made! No, it doesn't look perfect, but it's a great first try. She loves it, and "gave" the blanket to her baby, who sleeps under it on her zebra pillow in bed at night. I love encouraging my children to develop themselves through art- Whether they want my yarn scraps from when I'm weaving in ends, or if they're using our old toilet paper rolls, I want them to explore their creativity, discover their likes and dislikes, and find yet another way to express themselves. 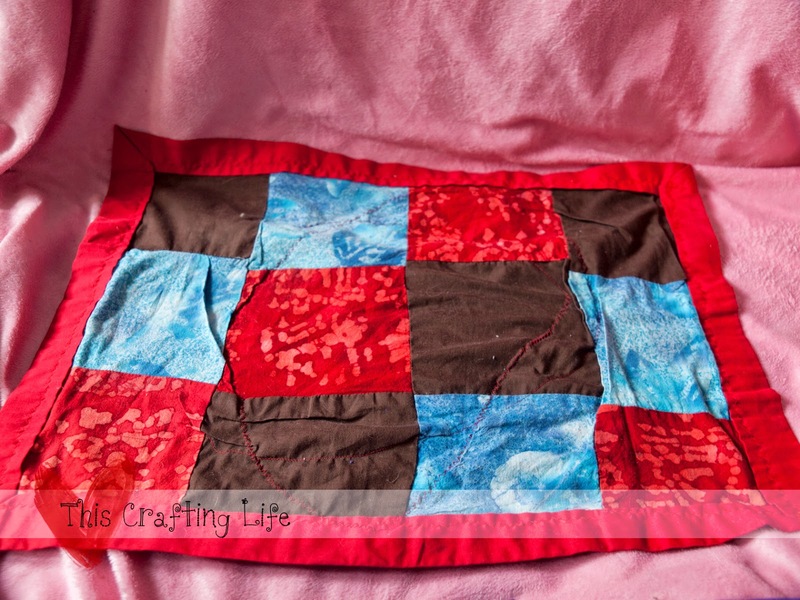 Is there a way that you encourage your children through crafting? Leave me a comment!